The 2019 Young Rider International Dream Program will be held July 15-22nd at the CHIO Aachen. The application links for Young Riders and adult chaperones can be found on the right-hand sidebar of this page (desktop) or by scrolling down (mobile). Follow TDF's International Dream Program on Facebook for the latest news! 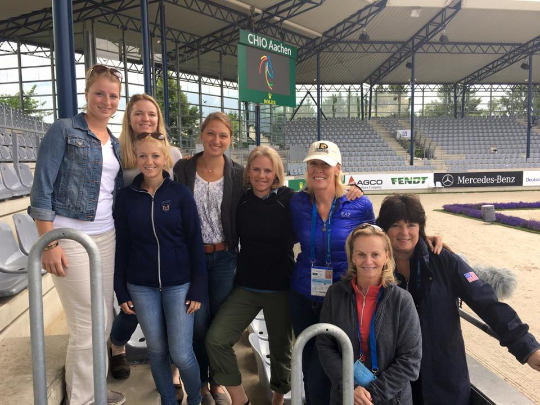 In 2000, Michael Poulin, Olympian and TDF Board member proposed a new program idea to take four top young American dressage riders to Europe for a two-week introduction to European dressage trainers, riders, facilities and events. The concept of the program is to allow Young Riders the opportunity to enhance their understanding of dressage theory through this European experience. The Young Riders observe, discuss and absorb the European training system. They watch their peers compete in shows and championships and they visit with top European trainers and riders. The program is open to USDF Young Riders, 16-21 years of age, and 22-year-old riders who participated in Young Riders last year, who are riding at Fourth Level or above. Applicants must be U.S. Citizens. A National Selection Committee comprised of leading dressage persons selects the riders from applicants who have filled out an extensive application form, written an essay, and have secured written recommendations - both personal and professional. Selection is based on merit, riding proficiency, a history of volunteering in the dressage community and commitment to training in the sport of dressage.